Until recently, Alaska has been considered free of invasive submerged aquatic plants that greatly impact freshwater resources in other areas of the world where they are not native. 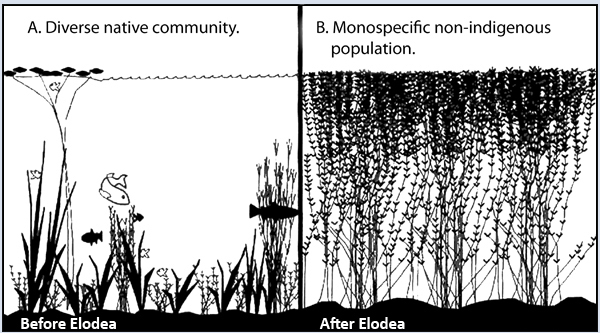 The discovery of Elodea in Chena Slough in Fairbanks in 2010 drew attention to an established population in the Eyak Lake and led to the discovery of Elodea in other waterbodies near population centers in four regions of the state. If Elodea continues to spread, the less control we will have over the outcome of Alaskan freshwaters; threatening biodiversity and costing our citizens. Elodea is an underwater perennial plant that sometimes forms tangled masses in lakes, ponds, and ditches with long, trailing stems and green, somewhat translucent leaves. 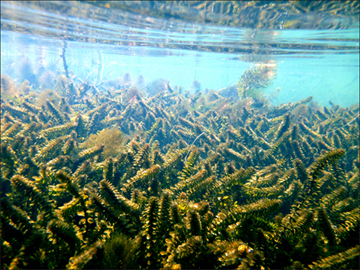 Elodea primarily reproduces by stem fragmentation and rarely by seed. Broken plant fragments can root to form new plants. Elodea prefers cool, clear, slow waters with silty bottoms. It is a hardy perennial that does not fully die back and can survive harsh winters under ice.  Form new plants from broken segments.  Survive when frozen in ice and travel long distances downstream. Individual plants can vary, depending on growing conditions; some are bushy and robust, others look stringier with weak stems and few leaves. Long, trailing stems can be seen in tangled masses when Elodea is well established. 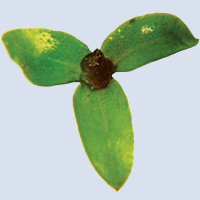 Individual plant fragments can also be seen floating on the water's surface.  Leaves in whorls of 3 or occasionally 4.  Leaves are 1/4-1/2" long & 1/8" wide.  Stem is a lighter green than the leaves and grow in a tangled mass. 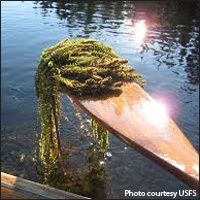 Elodea is not native to Alaska, and it is the first invasive freshwater aquatic plant known here. It has the potential to impact freshwater resources and fish habitat statewide.  Degrades fish habitat and displaces native flora and fauna.  Makes boat travel difficult and reduces recreation opportunities.  Fouls float plane rudders.  Alters freshwater habitats by decreasing flow & increasing sedimentation. associated with water related activities. 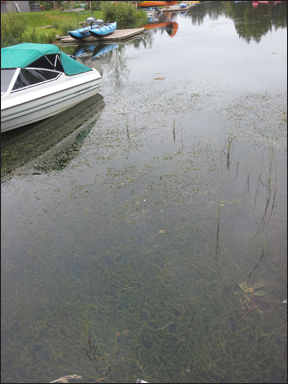 Elodea can form dense mats as seen here in 2013 in Sand Lake. 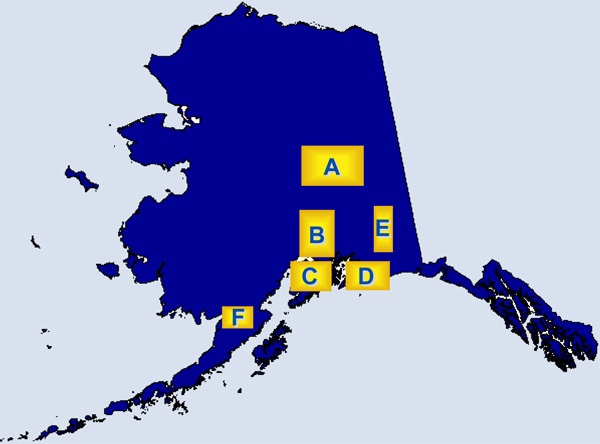 Though first documented in 1982 in Eyak Lake, Cordova, land managers did not take notice of this plant until 2010, when it was found growing aggressively in Chena Slough near Fairbanks.Since 2010, Elodea has been found in four regions of the state (see map below) and additional surveys are on-going. 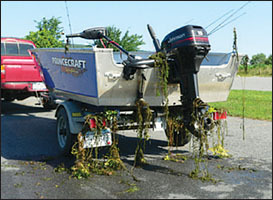 Elodea can spread to new locations and waterbodies through tiny plant fragments carried by float planes, boats, trailers, aquariums, and toher equipment. Elodea has a long history as an invasive plant. It was introduced to Great Britain over a century ago, and has since spread to Scandinavia and across Russia to Lake Baikal. 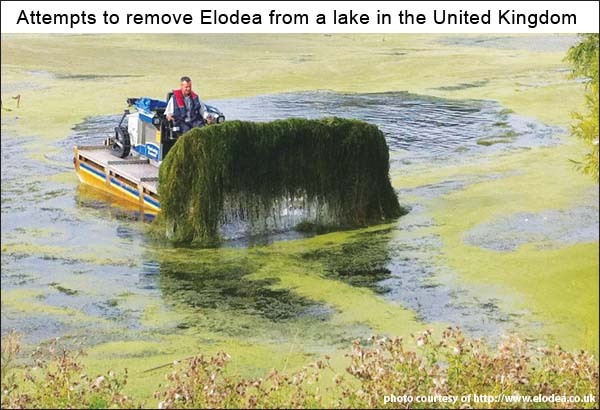 Whether you are boating, fishing, flying or recreating, there are steps you can take to help prevent the spread of Elodea. See our resources tab for more information. CLEAN - Remove all visible mud, plants, fish/animals from equipment. DRAIN - Eliminate water from all equipment before transporting. salt water if possible, allow 5 days to dry before entering new waters. came from that water body.  Aquarium plants and animals may be able to survive in our Alaskan waters!  Dispose of aquariums responsibly, not by dumping them into waterways.  Note its habitat: Did you find it in a river or lake? How deep was the water? Was the water clear or slightly muddy? it somewhere safe so it doesn't break up. Aquatic plants dry quickly.  Report it: Call the Invasive Species hotline below to report it!